Blue Blurry Lines: The Miracle of Fatima: Photographic Proof from the Vatican and LIFE magazine? 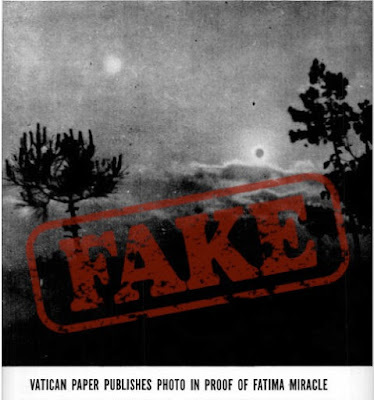 The Miracle of Fatima: Photographic Proof from the Vatican and LIFE magazine? LIFE magazine used to be a vital part of the average American household, delivering a mixture of news and entertainment, always accompanied by large, striking photographs. In 1951, they carried some sensational news about the 1917 "Miracle of the Sun" at Fatima in Portugal. The Vatican had released photographs as proof of it, evidence of "rigorously authentic origin." PICTURE OF THE WEEK Sirs: Recently you gave the distinction Picture Picture of the Week (Life, Dec. 3) to a picture of the Fatima "miracle" published in L Osservatore Romano as of "rigorously authentic origin." Now that the picture has been designated a fraud by the official newspaper of the shrine of Fatima, I trust that you will publish a retraction, out of journalistic honesty and in fairness to the many doubters who objected to the picture. In reprinting the picture published first by L'Osservatore Romano, LIFE merely quoted the claims of the Vatican newspaper. Subsequently the official newspaper of the shrine of Fatima stated that the picture was taken in 1922 (not 1917), at sunset (not noon) and several miles from Fatima. -ED. LIFE's "retraction" was given much smaller space than their original story. Checking old newspapers provided better details. If I understand correctly, then the fuss was over nothing. God, Mary and Miracles are "unlikely" to be photographed. The Pope may have indeed been seeing things, but the point remains that the photograph is not genuine.